Considering purchasing the American DJ Mega TriPAR Profile Plus? Have questions? Ask people who've recently bought one. Can 4 lights work in unison from a remote control or does the remote control one and the rest linked by cable? You can also set the first light in the master / slave chain so that IR remote is ON, then set the remaining fixtures to IR remote OFF. This will ensure that there is no conflict between the IR remote and other fixtures (apart from the master) in the chain. This is covered in the instruction booklet that comes with the units. 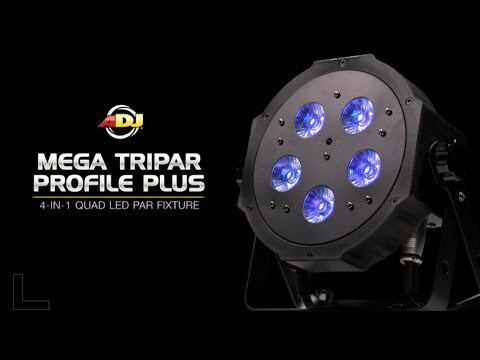 Do you own the American DJ Mega TriPAR Profile Plus? Why not write a review based on your experience with it. I ordered two of these lights very recently and have only been impressed from the start. I have so far used them for up lighting a room and used on a small stage as the main colour lighting. I have so far been incredibly impressed and would highly recommend them to anyone considering purchasing them. Love these lights. Great for uplifting, or illuminating signs or scrims. Purchased 2 on a Tuesday and went back and got another 2 on the Friday. Perfect compact unit, very slim line, comes with rubber feet so it can sit sturdy in its back when used as an up lighter so very low profile to the ground, a bracket (scissor yoke) which also works as a stand when opened up so you can angle it as an uplighter against the wall or use the bracket to clamp to the truss or speaker stand as I do. Sound mode is very good, the sensitivity is by far better than all other lights I have so it’s instant change on beats. Linked up in DMX mode also is epic, the light that these produce is blinding but dimable with the added bonus of a UV light. With the 4 button pad and lcd display on the back you can alter many settings. Bough 12 of these in total now, first when they where the Mega Par Profile, Then The TriPAR and now the plus. Great lightweight lighting, perfect for dj setups and small band lighting. Also perfect for uplighting. The added UV has also come in handy. bought 8 of these lights in a package and they have a fantastic output with some great colour mixing capabilities. Fantastic uplighter effect used for dj. Top quality product and great service from DJ Kit as usual. These are really bright and nice and compact.. Great lights.. This light provides up lighting, sound activated lighting, strobe lighting, pulse/fade lighting, this is more versatile than any other light I own, I have 7 units that are in one bag that means portability and set is easy. Create an ambient mood and with remote control switch to a night club mood. 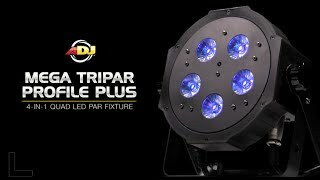 The ADJ Mega TriPar is an excellent fixture whether you are using it for uplighting, scrim / fixture lighting or band lighting. It produces a nice wide wash and there is excellent control over the R/G/B/UV elements allowing total control. This light gives some great pinks and pastilles which makes it ideal for weddings. These lights are a bargain and, especially with the remote, flexible and easy to control. The UV is a bonus. Great for washes and uplighting. Four of these could very well be all the lighting you ever need. And to top it all, they are extremely cheap. nice bright vivid colours, like the ability to daisy chain power, RC control great also. bought with the remote control it's straightforward after a few minutes to DMX and get the light doing as you expect. Small, silent, good connections and wide range of colours with a good fill distance. What's not to like! Already had bought two of these and needed more. Perfect for uplighting. Great lights for up lighting, just wish I ordered the rc2 remote at the same time. This is a great light for the money. Nice and bright. Easy to use and great colours. Powerful but so compact and light. Would highly recommend. Great service, once again, from Djkit. I have 4 of these lights and totally impressed with the output and the colour it produce. Will definitely buy another set of 4 soon. great product, does exactly what it says on the tip and arrived time, thanks DJkit once again. We have a small stock of around 8 of these lights and they are ideal for almost all the events we use them for. These lights are brilliant for up lighting truss, tables, cloths etc however they do work for lighting stages but require a large number to create a real effect. Overall thought they are great very well built and very robust can withstand all day-to-day hirer abuse. 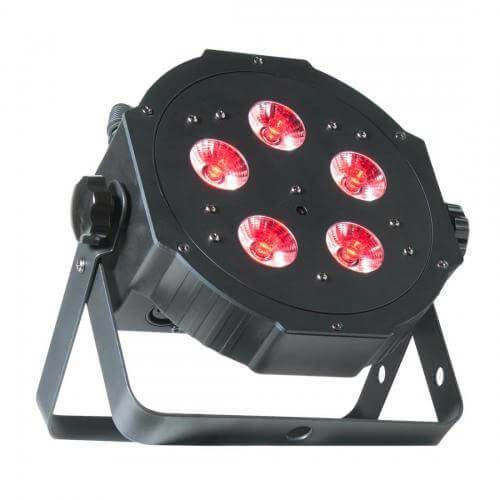 This product has a good light output and it's light weight, that UV really makes a big difference when using it with not only Red but Green too. I would recommend these as uplights and or for lighting engineers looking for cheap and affordable fixtures. I used two of these to light a band in The Leadmill Sheffield last night, they did the job perfectly. £109 a pair, it's a deal! Great piece of kit with more features than the old one , Very efficient delivery, highly recommended! Got 4 of these now brilliant lights with so many features well done adj these lights fit anywhere. Wanted them for up lights, they are very bright and look fantastic!! Specially UV !!! Put these little babies inside podiums and they look really cool. Lovely bright light with good built in programmes. Good value for money. Every DJ or band should have at least two of these lights set on sound to light mode hanging on their overhead stand trussing, they really light do light up any venue. Excellent product! Great product and a no mess experience of purchasing from this company. Would recommend to all. The light is great although i haven't used it for work but its a bit difficult to set as I couldn't find some of the programmes. Intend to call the seller to ask for help. With the daisy chaining for mains and DMX, feet on the back for uplighting and the stand for angled projection this is a good little performer. The only thing I found a little below par (excuse the pun) was the UV output is not as bright as I thought it would be but does sufficiently illuminate things for my needs. Sturdy, well made, and good value. This is the 2nd one I've ordered and am very happy with both units. Got two of these lights to use as a wall wash and on sound mode to improve the on-stage ambiance at a regular venue. A bright fixture with good colours which does the job well for a reasonable price. Simple to set up, link and leave to do its job. The optional remote makes it easy to switch between the various programmes if required providing you are close enough to the fixture. Will probably get another couple in the future. Simple to use, simple to link and a great strength of light giving you the flexibility to uplight in single colours or to run sound to light or through a dmx controller. Love them so much i bought 8 !!!! This is a great little light. Super bright, lightweight, portable and cheap, but yet still has an incredible build quality. I have been nothing but impressed with this fixture. This is a amazing light it is very bright and is good for uplighting. You can use the ADJ IR remote for simple control without DMX. I will defiantly buy another one. Ps if you can chose between this or the Mega Par Profile PLUS chose this it is brighter and has better colour mixing. Bright and good even light at 40 degrees. U V Useful as well. Very bright LEDS, Fantastic colours, Numerous built-in programs, very good build quality, easy to operate menu. Nice sturdy construction, great colour mixing the only thing I don't like is the menu goes into standby mode and takes a while to come back online, gives the appearance of it not responding. Adding UV to the already excellent Mega Tripars is a smart and welcome move. The UV adds real punch to colours, making them pop and is great fun on its own if that's your thing. The IEC/DMX in/out on opposite sides may not suit everyone but actually works really well. They also sit completely flat on the floor so yokes can be removed which is also a nice feature. Overall brightness is good, as is build quality. S2L and master slave offers a coordinated light show but a DMX controller takes them to that next level of professionalism. I hope ADJ add 'plus' to the Ultra Bars next - it's a nice middle ground and price point without having to purchase full hex products. Love these lights, great colours, fairly bright and a myriad of options for the display mode. My only criticism would be the manual which is next to useless. This is the reason the dropping to 4 stars. Be prepared to spend some frustrating time figuring out how they work, but once you do, the effort is worth it. Lovely Bright Lights. Small, compact smart lighting....Love them. Seen a video for American DJ Mega TriPAR Profile Plus online or have you own video? Check out American DJ Mega TriPAR Profile Plus on DJkit.com!